Why Wasn&apos;t the Russian Meteor Detected Before it Entered the Atmosphere? This is the question that keeps cropping up, and it deserves an answer. Images are being posted showing the fragments and they look like ordinary chondrites of asteroidal origin. This material is dark, and not very reflective, which makes it difficult to spot out in outer space, especially if the object is bus or house size. Astronomers measure brightnesses in magnitudes — the larger, more positive the number, the fainter the object is. The Sun is magnitude -27, the planet Venus -4, the star Vega 0, and the faintest star you can see is about +6. The best asteroid survey telescopes have a magnitude limit of about +24, which is about 16 million times fainter than what you can see with the unaided eye. 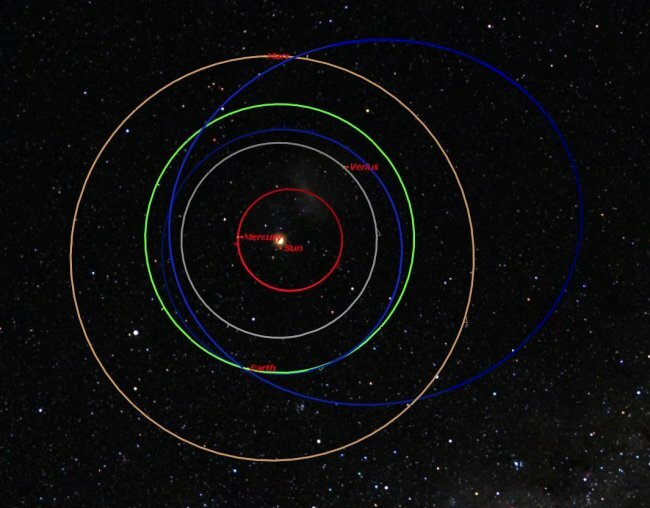 We can now use the latest orbit determined by Dave Clark (and yes, the meteor came roughly from the East, not from the North as stated in the initial NASA reports) and combine it with the estimated size and reflectivity to figure out when we should have seen the meteoroid in the asteroid survey telescopes. The calculations can be displayed in a graph like this one. 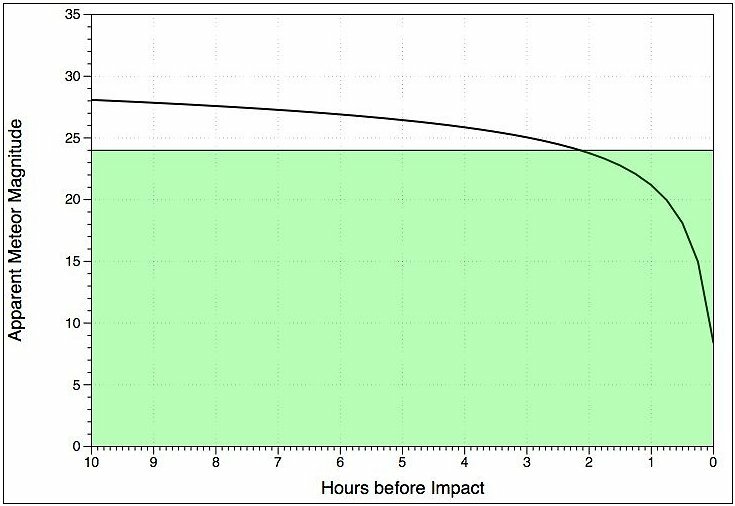 Note that, even with very large telescopes, the meteoroid would not have been visible until a mere 2 hours (135,000 km from Earth) before impact — very little time to sound a warning. Even if we had been looking at the right spot and the right time, there is another problem — the meteoroid would be in the daylit sky, and telescopes cannot see faint objects in the daytime. Simply put, the meteoroid was too small for the survey telescopes and came at us out of the Sun. Author Marshall Space Flight CenterPosted on February 19, 2013 May 23, 2013 Categories UncategorizedTags DA14, Marshall Space Flight Center Meteoroid Environment Office, NASA, Russian meteor31 Comments on Why Wasn&apos;t the Russian Meteor Detected Before it Entered the Atmosphere?